Our team is a small group of people who come from different backgrounds with diverse training and experiences allied toward a common goal. We draw from each other’s strengths and support each other with a synergistic quality that grows stronger the longer that we work together. At a very young age, I realized the impact that a mindful and compassionate dental care team can have. Being a “frequent flyer” as a child in the dental chair, my experiences easily could have turned into negative ones. Instead, my experiences were pleasant and inspired me to pursue a career in the dental field. 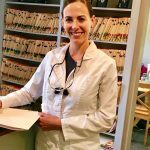 I am delighted to be part of Howard Dental Center’s team and support our primary goal: each and every one of our patients feeling as if they were truly cared for. My dental career began in 2000 and I graduated from Northeast Wisconsin Technical College in 2003. I have gained diverse experience in family and pediatric dentistry, as well as oral surgery. While patients are in my care, my goal is for each individual to feel respected, safe and comfortable. 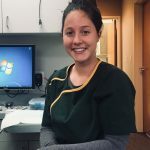 With overall health and dental health being so interconnected, much attention is paid to caring for the wellness of the entire individual, not just limiting the focus to the gums and teeth. Outside of the dental office, I enjoy being outdoors with my husband and son. We love downhill skiing, camping, hiking and gardening. I am also a wholesome food enthusiast that stays busy in the kitchen with cooking, canning and fermenting. Since 2015, I have been a certified yoga instructor, specializing in gentle and therapeutic yoga.